For years, the quirky and creative in Santa Barbara have produced a controlled-chaos parade celebrating Solstice Day. No boring floats allowed. Instead, over-the-top ensemble costumes, pumping Congo drums, performance art floats and synchronized Brazilian skin. Assistants Jeremy James Roloff and Nico Steele test the highlights while I hold down the shadows Photo: Kevin Steele. 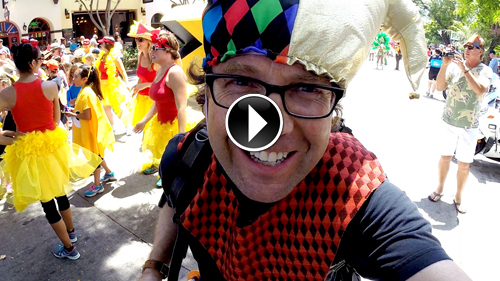 Second, working with the the Parade management, I mounted my 5 trusty embedded GoPros on floats, helmets and poles to film the camaraderie of the Solstice Parade People building their floats before the big day and then their colorful steps through downtown. Me adjusting the helmet camera on the parade coordinator.